Clean and spacious room with comfy orthopedic mattress beds, a light modern decor with high ceilings and wood flooring. The room is well lit with spot lights as well as lampshades by the bedside. This room enables guests to choose between two configuration layouts either a King size bed or two single beds. The special feature to this studio room is the wide patio doors that lead out to a large garden with chairs for outdoor lounging. This room also has an open plan kitchen with gas hob, double oven, dishwasher, microwave, kettle, toaster and american fridge/freezer. This Apartment offers three very different rooms that are all equally welcoming, our first room is every spacious with a modern dark wood decor and huge bay windows. Our second room is a large modern double room that accommodates two people and has a garden view. Room three is an open plan superior studio room that is spacious and bright due to the large glass patio doors that lead out to a private garden with table and chairs, This apartment offers three very different rooms that are all equally welcoming. Our first room is very spacious and modern with a dark wood décor and huge bay windows, this room comfortably accommodates up to three people or can be adapted to a super king size bed. an with a nice size kitchen that boasts a gas hob, double oven, dishwasher and american fridge/freezer. 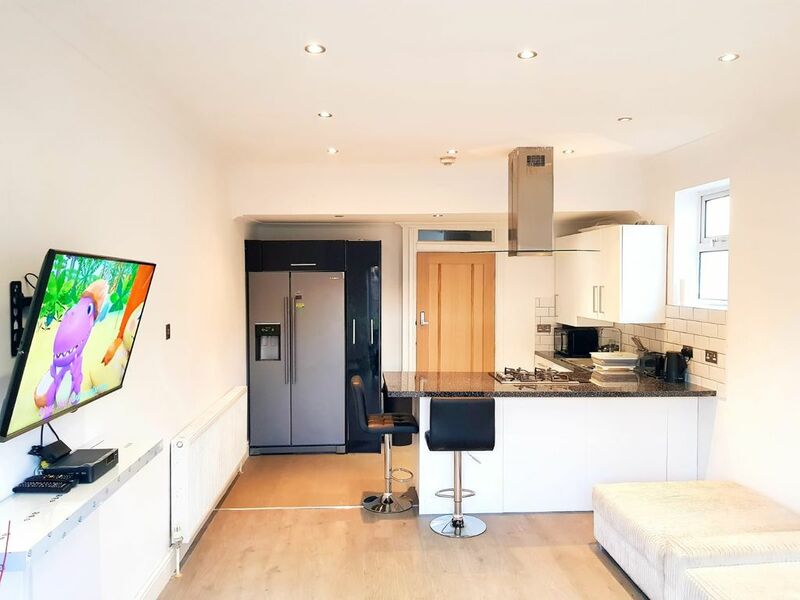 All our rooms have 43” flat screen television with amazon sticks for choice of movies and series, a microwave, kettle and toaster and a place for storing clothes. Off street parking is available subject to availability, conveniently Cogie Abode is located within close proximity to Southbury train station, Enfield Town, 24 hour Tesco extra, restaurants, fast food vendures, banks, cineworld and southbury leisure centre, transport links such as buses 279, 349, 121 and 307 stop directly outside the property and there is also an off license store right across the street which makes this location fantastic!! Cogie Abode is in a conveient location with a late night off licence open till 12am situated a stones throw away. A 24hour Tesco Extra 2 minutes walk away. Several restaurants & fast food vendures within short walking distance (Turkish, Chinese, Indian & chicken & chips to name a few).